Join Us!!! We are looking for someone to help us cover Asia Champions Cup basketball. Please send us an e-mail. Sharjah fired past As Seeb to advance into the semifinal stage. It was a very close game until the last quarter, when Al Sharjah's pressure prevailed and they won that period 27-14 extending their advantage to 16 points. They made 18-of-23 free shots (78.3 percent) during the game. Al Sharjah looked well-organized offensively handing out 22 assists. American forward Tyler Wilkerson (203-88, college: Marshall) stepped up with a double-double by scoring 46 points (!!!) and 11 rebounds for the winners and his fellow American import point guard Marvelle Harris (196-93, college: Fresno St., agency: Slash Sports) chipped in 24 points and 9 assists. At the losing side American guard Louis Munks (190-90, college: PVAMU, agency: Interperformances) responded with 28 points and 7 rebounds and Bosnian-Serbian center Mile Ilic (215-84) produced a double-double by scoring 20 points, 12 rebounds and 4 assists. Both coaches used bench players which allowed the starters a little rest for the next games. Shabab Al Ahli rolled past Al Arabi to remain in the title fight. The guests took control from the first minutes by winning the initial quarter 23-16. But Al Arabi won second period 21-15. However it was not enough to take a lead and get a victory that evening. They outrebounded Al Arabi 43-28 including 29 on the defensive glass. Shabab Al Ahli players were unselfish on offense dishing 26 assists. Center Qais Alshabebi (200-91) nailed a double-double by scoring 19 points, 11 rebounds and 5 assists for the winning side and American guard Kevin Murphy (197-90, college: Tenn Tech) accounted for 21 points, 8 rebounds and 6 assists. American-Iraqi point guard Kevin Galloway (200-88, college: Texas Southern) came up with a double-double by scoring 17 points, 14 rebounds and 6 assists and swingman Khalid Suliman (198-87) added 21 points and 5 assists respectively for Al Arabi in the defeat. Both teams had four players each who scored in double figures. Manama topped Uhud to make it into the semifinals. The guests trailed by 2 points at the halftime before their 35-23 charge in the third quarter, which allowed them to win the game. Manama dominated down low during the game scoring 62 of its points in the paint compared to Uhud's 42. They looked well-organized offensively handing out 31 assists comparing to just 17 passes made by Uhud's players. Polish-Swedish power forward Maciej Lampe (211-85) fired 32 points, 9 rebounds and 9 assists for the winners. American guard Terrico White (196-90, college: Ole Miss) chipped in 25 points. Manama's coach used a ten-player rotation and allowed the starting five to rest. Guard Shane Rector (188-94, college: Utah St.) produced 26 points and 9 rebounds and American Musa Abdul-Aleem (196-88, college: Troy) added 26 points and 6 rebounds respectively for lost side. Both teams had four players each who scored in double figures. Shamal overcame Al Ahli in the quarterfinal clash. The game was mostly controlled by Al Shamal. Al-Ahli was better in second period 19-16. But it was not enough to take a lead and get a victory that evening. They dominated on the defensive end, holding Al-Ahli to just 7 points in first quarter. Al Shamal made 16-of-19 charity shots (84.2 percent) during the game. They outrebounded Al-Ahli 47-32 including a 38-21 advantage in defensive rebounds. Worth to mention a great performance of Algerian forward Mohamed Harath (198-90) who helped to win the game recording a double-double by scoring 21 points, 23 rebounds and 4 assists. 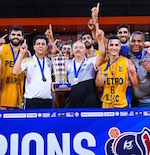 Egyptian center Omar Salem (205-83) contributed with 18 points and 7 rebounds for the winners. Four Al Shamal players scored in double figures. American-Bahrain Wayne Chism (206-87, college: Tennessee) answered with a double-double by scoring 34 points (!!!) and 13 rebounds and American-New Zealand forward Marcel Jones (203-85, college: Oregon St.) added 15 points and 9 rebounds in the effort for Al-Ahli. The most important game in the last round took place in Doha between second ranked Qatari Al Arabi (1-2) and fourth ranked Saudi Arabian Uhud (1-2) on Tuesday night. Al Arabi was defeated by Uhud at home 90-73. It was a key game for the second position in Group A. The guests trailed by 9 points after first quarter, but they stormed back and won the game by 17 points. 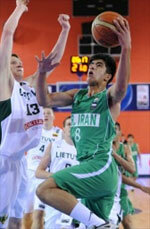 Uhud made 24-of-27 free shots (88.9 percent) during the game, while Al Arabi only scored five points from the stripe. American Musa Abdul-Aleem (196-88, college: Troy) fired 40 points (!!!) for the winners. Guard Shane Rector (188-94, college: Utah St.) chipped in 29 points, 7 rebounds and 5 assists. American-Iraqi point guard Kevin Galloway (200-88, college: Texas Southern) produced a double-double by scoring 19 points, 15 rebounds and 7 assists and swingman Khalid Suliman (198-87) added 16 points, 10 rebounds and 7 assists respectively for lost side. Both teams had four players each who scored in double figures. Defending Saudi Arabian champion left bottom position moving up to second place in Group A, which they share with 3 other teams including defeated Al Arabi. Very important is a road loss of second ranked Qatari Al Shamal (1-2) against fourth ranked Omani As Seeb (1-2) on Tuesday night. Visiting Al Shamal was defeated by As Seeb in a tough game on the road 88-94. The hosts took control from the first minutes by winning first half. But Al Shamal won third quarter 27-23. However it was not enough to take a lead and get a victory that evening. The game was decided in the last minutes when As Seeb won last quarter 30-25. They made 17-of-19 charity shots (89.5 percent) during the game. Worth to mention a great performance of American guard Louis Munks (190-90, college: PVAMU, agency: Interperformances) who helped to win the game recording 43 points (!!!) and 5 rebounds. Bosnian-Serbian center Mile Ilic (215-84) contributed with 30 points and 9 rebounds for the winners. Algerian forward Mohamed Harath (198-90) replied with a double-double by scoring 41 points (!!! ), 12 rebounds and 6 assists and American guard Jeff Newberry (188-92, college: Oklahoma St.) added 14 points, 7 rebounds and 4 assists in the effort for Al Shamal. As Seeb left bottom position moving up to second place in Group B, which they share with Manama and Al Shamal. An exciting game was played in Manama. Top-ranked UAE Shabab Al Ahli faced their biggest opponent Bahrain Manama. Guests from Dubai (3-0) smashed host Manama (1-2) 95-73. The game without a history. Shabab Al Ahli led from the first minutes and controlled entire game increasing their lead in each quarter. They dominated down low during the game scoring 48 of its points in the paint compared to Manama's 26. They outrebounded Manama 38-25 including a 29-16 advantage in defensive rebounds. Shabab Al Ahli looked well-organized offensively handing out 23 assists. Worth to mention a great performance of American power forward Chris Johnson (210-85, college: LSU) who helped to win the game recording a double-double by scoring 22 points and 19 rebounds and the other American import guard Kevin Murphy (197-90, college: Tenn Tech) who added 22 points, 8 rebounds and 8 assists (on 7-of-9 shooting from the field) during the contest. Five Shabab Al Ahli players scored in double figures. At the losing side American guard Terrico White (196-90, college: Ole Miss) responded with 14 points, 7 rebounds and 9 assists and guard Husain Altawash (174-86) scored 13 points and 4 assists. The winner was already known earlier in the game, so both coaches allowed to play the bench players saving starting five for next games. Shabab Al Ahli have a solid three-game winning streak. Defending UAE champion maintains first position in Group B with 3-0 record. Manama at the other side dropped to the bottom place with two games lost. They share the position with As Seeb and Al Shamal. Very significant was UAE Al Sharjah's (#1, 3-0) victory against Bahrain Al-Ahli (1-2) 84-79. It was an exceptional evening for American point guard Marvelle Harris (196-93, college: Fresno St., agency: Slash Sports) who led the winners with a double-double by scoring 39 points (!!! ), 14 rebounds and 5 assists. His fellow American import forward Tyler Wilkerson (203-88, college: Marshall) accounted for 28 points and 12 rebounds for the winning side. American-New Zealand forward Marcel Jones (203-85, college: Oregon St.) came up with a double-double by scoring 22 points and 18 rebounds and American-Bahrain Wayne Chism (206-87, college: Tennessee) added 24 points and 13 rebounds (went 8 for 8 at the free throw line) respectively for Al-Ahli in the defeat. Four Al-Ahli players scored in double figures. The game in supposed to be also quite interesting. UAE Shabab Al Ahli (2-0) played at the court of Omani As Seeb (0-2). Shabab Al Ahli smashed As Seeb 108-86 on Monday. Shabab Al Ahli made 20-of-26 free shots (76.9 percent) during the game. They looked well-organized offensively handing out 33 assists comparing to just 16 passes made by As Seeb's players. The best player for the winners was American power forward Chris Johnson (210-85, college: LSU) who had a double-double by scoring 35 points (!!! ), 11 rebounds, 5 assists and 5 blocks. His fellow American import guard Kevin Murphy (197-90, college: Tenn Tech) chipped in 25 points, 8 rebounds and 4 assists. At the other side the best for losing team was American guard Louis Munks (190-90, college: PVAMU, agency: Interperformances) who recorded 35 points (!!!) and 7 rebounds and Bosnian-Serbian center Mile Ilic (215-84) added 18 points, 14 rebounds and 5 assists respectively. The winner was already known earlier in the game, so both coaches allowed to play the bench players saving starting five for next games. Shabab Al Ahli will meet Manama (#3) in the next round, which may be the game of the day. As Seeb will play against Al Shamal and hopes to get finally their first victory. The most crucial game of the last round was a loss of Bahrain Manama (1-1) in Doha on Monday night. Visitors were defeated by Qatari Al Shamal (1-1) 89-79. Al Shamal made 19-of-22 free shots (86.4 percent) during the game. Al Shamal outrebounded Manama 47-31 including 32 on the defensive glass. It was a great evening for Algerian forward Mohamed Harath (198-90) who led his team to a victory with a double-double by scoring 36 points (!!!) and 20 rebounds. American guard Jeff Newberry (188-92, college: Oklahoma St.) helped adding 26 points, 11 rebounds and 5 assists. The best for the losing side was American guard Terrico White (196-90, college: Ole Miss) with a triple-double by scoring 18 points, 10 rebounds and 10 assists and Polish-Swedish power forward Maciej Lampe (211-85) produced a double-double by scoring 18 points, 10 rebounds, 8 assists and 4 blocks. Manama's coach rotated ten players in this game, but that didn't help. Al Shamal is looking forward to face As Seeb (#4) in the next round. Manama will play against Shabab Al Ahli and it may be a tough game between close rivals.